A recurring question is, how is examined the current energy-dependent effectiveness of the detector. Particularly within the low-energy range smallest contaminations can affect the detector efficiency. 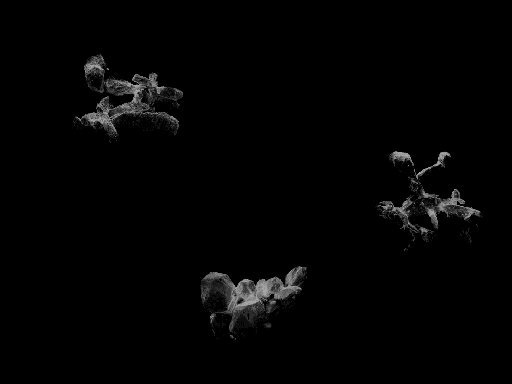 These contaminations influence also all analysis results and the detection limits. The effect of the contamination due to dry ice (CO2) on the detector-crystal in vacuum of the detection system depends on the quality of the Dewar. Modern systems avoid this effect completely and guarantee thereby a long-term stability of the efficiency. Other systems are equipped with a "thaw device", which permits a cyclic "conditioning" of the detector. 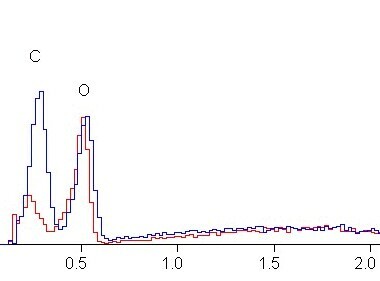 However, if and when a conditioning must take place and like the efficiency within a cycle is worsened, is only possible with check measurements and evaluations of suitable spectra. For the analysis low-energy X-ray lines statements about the energy region far below 1 keV are to be met. The common usual examination and check of the detector efficiency with a Cu-specimen (comparison of the Cu-L with the Cu-K lines) is going to fail, since CuL with 923 eV is simply too high in X-ray energy for that purpose. CaCO3 (Calcite, marble) is very favorable for the examination and measurement of the efficiency for ultra thin window detectors. With 277 eV (carbon) and 525 eV (oxygen) there are two characteristic lines at the disposal, which are very sensitive due to their energy in relation to changes of the detector efficiency. The sample should be coated easily with carbon to avoid charging in electron microscope. The detector can be examined very sensitive by the net count ratios C/Ca and O/Ca. This method can be simply used for periodical checks. In the illustration the normal spectrum is compared with the case of a H2O contamination. The difference influence of H2O opposite CO2 is to be seen clear. Both layers have another energy-dependent absorption by their different composition of the elements. With H2O the Oxygen is hardly weakened, however Carbon strongly. CO2 leads to the attenuation of both lines in same order of magnitude. 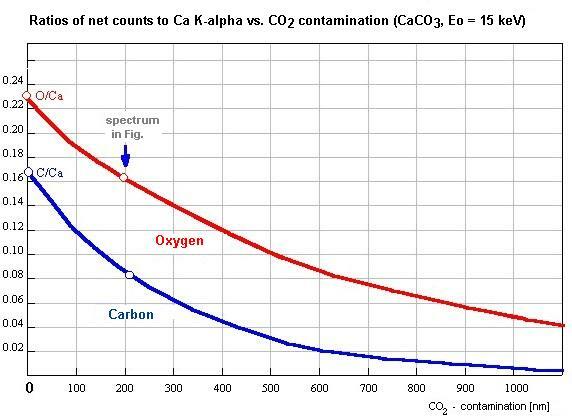 A strongly carbon-containing contamination would weaken a little Carbon, however the absorption for Oxygen is very strong. Therefore all substantial kinds of contamination can be kept apart. The alternative use of a Chromium sample (relationship of the Cr-L radiation to the Cr-K radiation) particularly supplies also sufficient measurable effects for contaminations which are containing Oxygen. That is since the L radiation of Crom lies energetically scarcely over the O absorption edge. A good monitoring of H2O- and particularly of CO2- contaminations is given. The measuring effect for carbon is smaller, but still available. The disadvantage of the use of a Cr-sample with only one line in low-energy region is the not given ability to distinguish between different kinds of contaminations.